The all-time Bee Gees’ Smash Hit Musical is ready to Heat-Up Kuala Lumpur this September 2015! Milestone Production, the leading show promoter in Malaysia is proud to be the official organizer of yet another internationally acclaimed musical – the iconic Broadway and West End disco marvel – Saturday Night Fever. 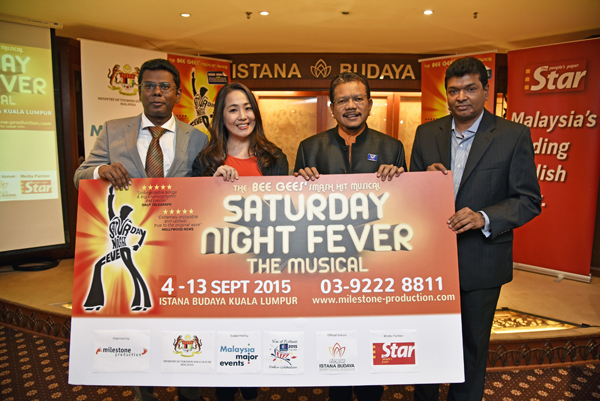 Supported by Malaysia Major Events, a division of Malaysia Convention & Exhibition Bureau, an agency under the Ministry of Tourism and Culture Malaysia, this sensational Bee Gees’ smash hit musical will heat-up Istana Budaya, Kuala Lumpur from 4 September 2015 – 13 September 2015. (From left) General Manager of Malaysia Major Events (MME), Malaysia Convention & Exhibition Bureau (MyCeb) Mr. Tony Nagamaiah, Managing Director of Milestone Production Ms. Grace Lee, Director of Istana Budaya Dato’ Mohamed Juhari Shaarani, and representative from The Star Media Group Mr. Brian Martin. Featuring an amazing collaboration of award winning creative talents and headlined by hugely talented cast and musicians, the Saturday Night Fever 2015 Asian Tour, its first in eleven years will be jive dancing into the Malaysian stage with a repertoire of Bee Gees’ hit classics such as “Stayin’ Alive”, “Night Fever”, “More Than A Woman”, “Tragedy”, “Disco Inferno”, “How Deep is Your Love”, and “You Should Be Dancing”. Audiences will be captivated by the legendary disco choreography, the glittering costumes and retro hairstyles, in all its groovy glory—amid the dramatic backdrops of New York, the Manhattan skyline and the pulsating strobe lights of the infamous retro ’70s disco era; the full set being brought all the way from Broadway to our doorsteps. Based on the wildly popular 1970s film that defined the disco phenomenon and starring Oscar-nominee John Travolta, Saturday Night Fever depicts the uncompromisingly sordid 1970’s New York that not only made a dance revolution at that time, but also spoke straight to a generation of lost, struggling young adults. 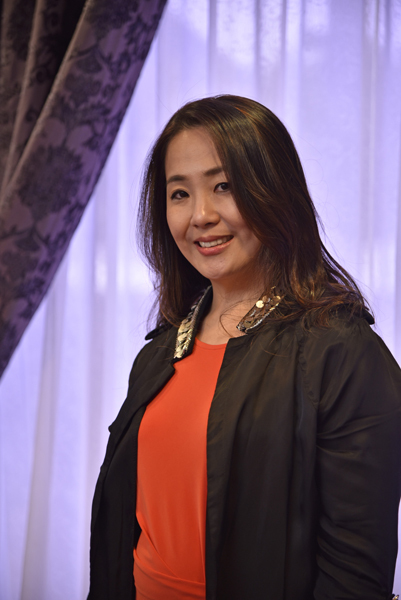 Ms Grace Lee, Managing Director of Milestone Production. Premiered in the West End at the London Palladium in 1998 and Broadway at the Minskoff Theatre in 1999, the spectacular musical Saturday Night Fever has been seen by over 10 million people with over 2,800 shows in more than 20 countries across the globe, thrilling theatre and music buffs alike throughout the years. As one of the longest running musical, Saturday Night fever is still actively on world tour up to this very date ; bridging the young and old with a common interest of a fantastic musical performance. 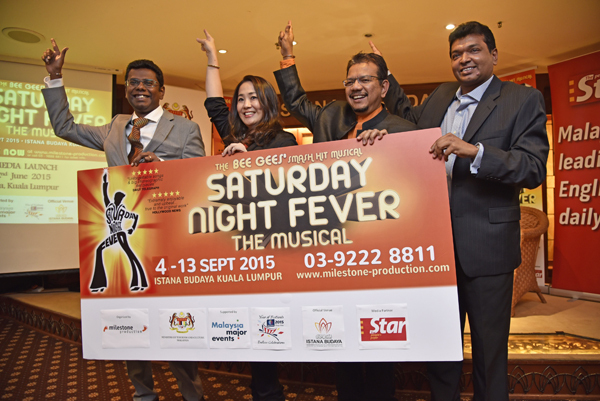 Grace Lee , Managing Director of Milestone Production was quoted in her speech during the recent media launch on 2nd June 2015 that the staging of Saturday Night Fever here in Malaysia is in line with Milestone Production’s consistent effort in bringing world class theatre productions to our shores. Milestone Production aim to help build the nation’s status as a hub for the performing arts in this region which surely will greatly contribute to efforts in making Malaysia the top-of-the-mind tourist destination. So, dust off those hip-hugging flares, platform shoes and warm up the disco dance moves. “You Should Be Dancing” your way to this jam-packed, dance-crazed, fuel-injected “Disco Inferno”, with groovy sets and disco lighting for almost two-and-a-half hours of energy, music and oh-so-stylish bell bottom pants! Proudly presented by Milestone Production, tickets for this smash hit musical are now open for sale. Tickets are priced at RM568 (VVIP), RM398 (VIP), RM338 (CAT A), RM268 (CAT B), RM138 (CAT C) – (Ticket prices are inclusive of 6% GST but not inclusive of RM4 ticketing fee). Discounts up to 25% off regular ticket prices are available, for more information on the ongoing ticket promotions please log on to www.milestone-production.com or call 03-92228811.